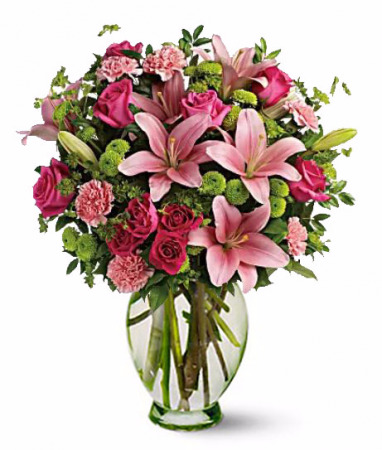 This Fabulously Feminine Bouquet Features Hot Pink Roses, Hot Pink Spray Roses, Pink Asiatic Lilies, Pink Carnations, Green Button Spray Chrysanthemums, Bupleurum, Huckleberry And Lemon Leaf, Delivered In A Clear Glass Vase, Orientation: Onesided. 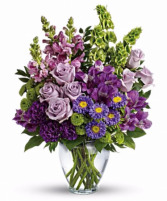 This Lovely Bouquet Features Lavender Roses, Purple Alstroemeria, Purple Carnations, Lavender Matsumoto Asters, Green Button Spray Chrysanthemums, Lavender Snapdragons, Bells Of Ireland, Huckleberry And Lemon Leaf, Delivered In A Clear Glass Vase, Orientation: Onesided. 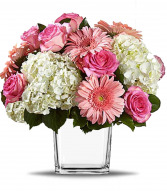 The Stylish Deluxe Bouquet Features A Generous Amount Of Large Red And Pink Roses Accented With Smaller Spray Roses In Shades Of Red And Pinks Delicate Green Oregonia And Pittosporum Add A Fresh Contrast, The Flowers Are Delivered In Our Glass Cube Vase, Orientation: Allaround. 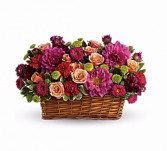 Hot Pink Flowers Dahlias, Matsumoto Asters And Carnations Are Arranged With Pale Orange Roses, Purple Stock And Bright Green Button Mums In A Natural Rectangular Basket, Orientation: Allaround. Color outside the lines with this incredible basket of summer flowers! Pops of hot pink, pale orange, deep purple and bright green spill over the sides of a rectangular basket. It's an exciting, heartfelt gesture to send a stylish friend, a colorful girlfriend or anyone who needs perking up.